Wow!! Willie T. hits all the high notes. More top-notch recruits than ever believed possible! Excitement! Energy! Success! He and his Pepsi-powered assistants are everywhere meeting with everyone. He takes losing teams and makes them winners. Taking an Oregon team with all the parts should make winning a tradition again. All this should happen, shouldn’t it? Perhaps – most likely – maybe. It should. But, he said something that gives me pause. Something that could change it all. Let me explain. 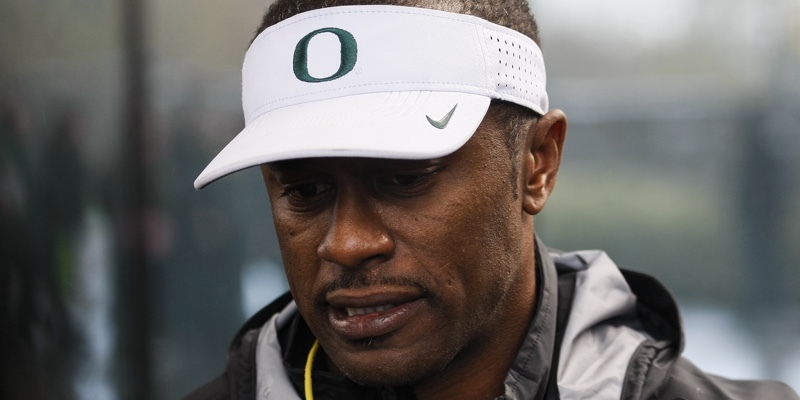 Shortly after Coach Willie Taggart came to Eugene, I had the opportunity to hear him and his assistants describe their recruiting objectives. Aside from the gaffes you might expect from people who never lived in Oregon (one coach said we need more dawgs on the team, another said something about the Duck Nation - egads! ), and with one exception, most of what they said was encouraging. But that exception is a big one. Colt Lyerla was talented, but troubled. Coach Taggart said they were looking for three things in potential recruits: character, academics and athletic ability. So far, so good. But he went on to say they would recruit players who had any two of them, and would work to see if they could change the third. Any two would do. First, I think he might have more accurately said, “I am looking for recruits with great athletic ability who have, at least, good character or good grades.” A short, fat, and slow kid who won a Nobel Prize for his science fair project and holds the Boy Scout record for helping little old ladies across the street will not get a football scholarship offer on the hope that he could be coached up become a tight end. Any two of athletic skill, character and academics actually means athletic skill and either character or academics. That might be the standard in the SEC or in the second-tier schools, and at one time might have even been Oregon’s. For the past few years, it has not been the standard for the “dawgs” in the “Duck Nation.” Oregon has targeted players who have all three. Through the last years of the Chip Kelly teams through today, all our LOI signees have been admitted to the University. A small number of student athletes have been dismissed for what could be called character issues, but it’s a small subset. The need to recruit student-athletes with good character and good grades is not just a holier-than-thou approach; it is important to the success of the team on the field. Extending a scholarship offer to a recruit who can’t meet academic requirements leads to a scramble to fill a void after the LOI deadline, and it’s likely the new player will not be as talented as someone Oregon could have targeted originally. Kiko Alonso sacks Russell Wilson in the Rose Bowl. Individual character issues end up penalizing the entire team. Players accepting payments from fans have resulted in penalties for the entire team. Efforts, beyond the rules, to avoid academic failure are staining the reputation of the University of North Carolina. These issues can start slowly, but accelerate to problems that bring entire programs down. There may be a time to take a chance on a good kid with an unfortunate background, but it takes diligence and detail to investigate. There are examples that show, perhaps, the Taggart standard is workable. LaMichael James had academic issues in high school. He even had to change high schools from Texas to Arkansas, a state with lower graduation requirements, to get his diploma. 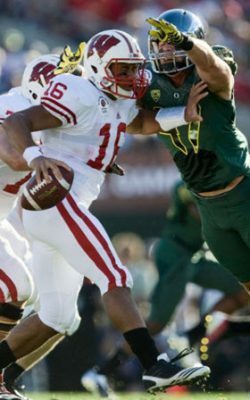 At Oregon, he made the All-PAC-12 Academic Team. Kiko Alonso had serious alcohol issues as a freshman, but with solid support, he completed his career without further incident. But these examples are few compared to instances on teams that downplay character and academics. With that in mind, I am still troubled that the apparent success of Oregon recruiting may be a function of lowered standards. Duck fans and the University of Oregon Administration have come to expect success in all areas, including character and academics. The best player in the world is useless if he gets suspended for academics or character issues.